A call to Camper & Nicholsons brings confirmation that David Sargus Jr has taken over the listing of the 30m motor yacht Livia in a joint central agency with Robert Drontmann at Moonen Brokerage. She was launched by Moonen in May 2010 to a design by by Rene van der Velden and was a finalist in the 2011 World Superyacht Awards. An interior by Art-Line accommodates eight guests in a master suite, VIP stateroom and two twin cabins while twin 600hp Caterpillar engines give her a range of 4,500 nautical miles at 10 knots. 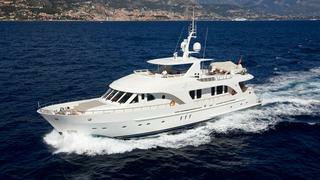 Livia is asking €7.95 million.